Curious learners know that there is always another dimension to discover. Far beyond traditional lectures and notes, transparencies and slideshows, the world of knowledge is full of amazing sound and color, shape and movement. In the ActivClassroom, the greatest educational show on earth starts as soon as the bell rings. ActivBoard+2 is a big part of the reason. On its surface, galaxies turn, lions roar, and eyes can’t help but face forward. Students see crisp, crystal clear images; interface with a tough facade that knocks, dings and even pointy objects won’t disturb; and view the lesson nearly shadow free thanks to a state-of-the-art short-throw projector system mounted directly to the board. ActivBoard+2 comes in a multitude of sizes and aspect ratios-from 64" and 78" traditional to 87" and 95" widescreen-and features both optional integrated speakers and a unique height-adjusting mount that makes everything from the smallest integer to the tallest peak accessible to everyone. The ActivBoard+2 makes interactivity easy by featuring easy height adjustable capability. The ActivBoard+2 is an all-in-one Interactive learning solution, a complete system that includes a choice of ActivBoard sizes, a choice of short-throw projectors (a PRM-20A LCD or PRM-25 DLP) and secure installation mountings. With the ActivBoard+2 system, the ActivBoard can be raised and lowered effortlessly with the included motorised hand control. It is easy to get started with the included ActivInspire software, and even plan for future connectivity with ready to interface with an optional infra-red receiver for connection with ActivSound audio enhancement. 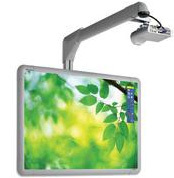 The ActivBoard+2 is an all-in-one Interactive learning solution, a complete system that includes a choice of ActivBoard sizes, a choice of short-throw projectors (a PRM-20A LCD or PRM-25 DLP) and secure installation mountings. It is easy to get started with the included ActivInspire software, and even plan for future connectivity with ready to interface with an optional infra-red receiver for connection with ActivSound audio enhancement. Installation ActivBoard+2 system requires installation by an authorized Promethean installer. What are the different types of ActivBoard+2? The ActivBoard+2 is available as a fixed or adjustable solution. What is included with the ActivBoard+2? What projectors are available for the ActivBoard+2? Two projector options are available with the ActivBoard+2 Range: The PRM20A (LCD), or the PRM25 (DLP).